The company which wanted to bring Formula One to Donington Park has gone into administration. Last month, Donington Ventures Leisure Limited lost a 17-year contract to stage the British Grand Prix after failing to get financial backing. It missed a series of funding deadlines after winning the contract from Silverstone in July 2008. Administrator Nigel Price said he wanted a buyer "with vision" who could still bring Formula One to the venue. Mr Price said: "This need not be the end of Formula One racing at Donington. It still remains a fantastic location." He added: "We are certainly hopeful that a 2011 Grand Prix could take place at the site. "We are looking for a purchaser for the business and the potential opportunity to bring Formula One to this part of the East Midlands by funding the work that needs to be carried out to the circuit. "It needs people of vision to get the dream to the starting grid." The firm's 40 full-time staff were called to meetings at the circuit earlier to be updated on the situation. Work to revamp the circuit in preparation for the Grand Prix began in February but, by the end of October, Donington Ventures Leisure Limited had failed to raise £135m from a bond issue to upgrade facilities. Motor racing at Donington Park ended last month so work could begin to prepare the venue for next year's Grand Prix. The last major race at the track was the British Moto GP in July. But the company missed a series of deadlines to show it had the financial backing to see the deal through. Part of the Donington track was dug up before the deal fell through and at the moment it is unusable. 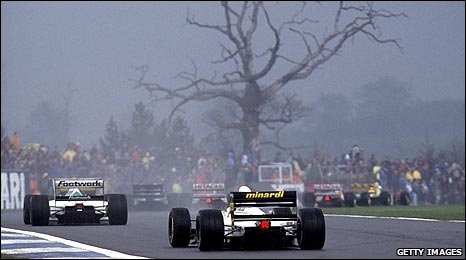 Silverstone, in Northamptonshire, has hosted every British Grand Prix since 1987, while Donington, which is synonymous with MotoGP, has held only one F1 race, the European Grand Prix in 1993. It is still not clear whether a deal can be done for the Silverstone track to stage the July 2010 British Grand Prix.